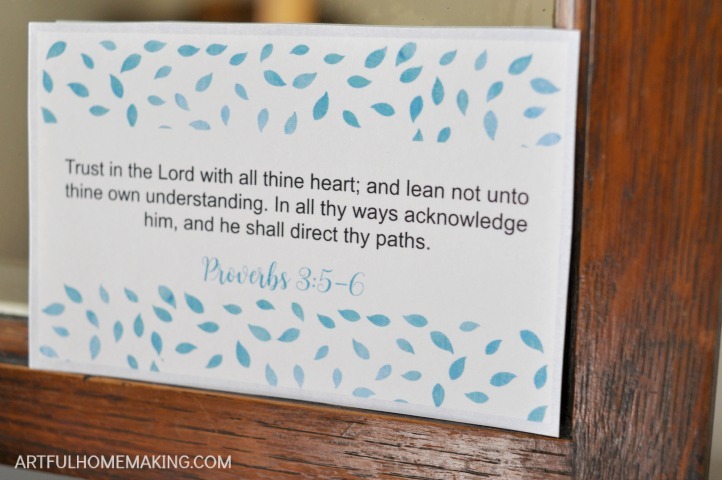 Printable Bible verse cards for moms to strengthen and encourage you in your mom journey! Motherhood is rewarding, challenging, and sometimes just plain hard. If we’re not careful, we can find ourselves worn out, burned out, and discouraged. Meditating on God’s Word can transform our minds and give us the strength we need to keep going and live abundantly. It’s so easy to fall into negative patterns of thinking, and that can really affect how we view life. If we’re thinking negative or untrue thoughts about ourselves, our families, or God, it can keep us from being joyful mothers. Instead, we need to meditate on truth, goodness, and beauty. Through my years as a mom, God’s Word has helped me and carried me through so many stressful times. Difficult pregnancies, unemployment, illness, and just everyday mom life. 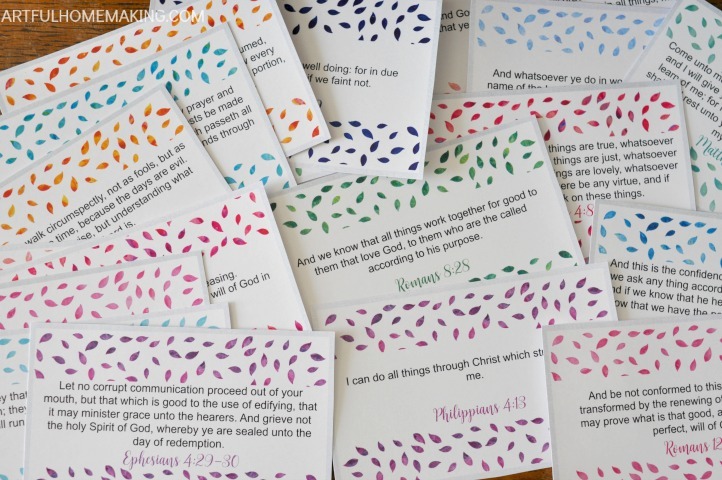 I wanted to make a set of Bible memory cards with all the verses that have encouraged me along the way. 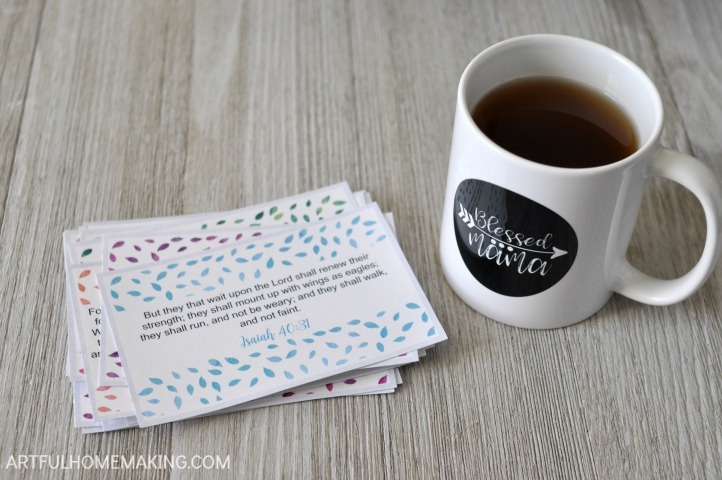 This set of 24 printable Bible verse cards for moms is the result of that desire. There were so many verses I could have included, but I had to stop somewhere! I ended up with 24 verses that have impacted me in my mothering journey. 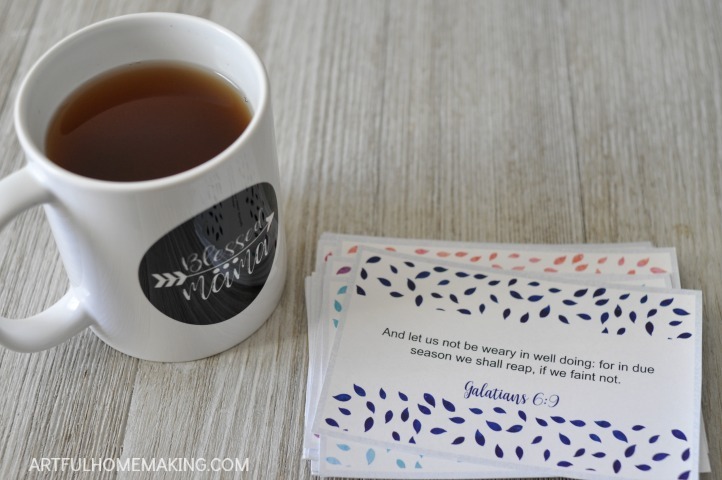 Enter your name and email in the form below to get your own set of FREE printable Bible verse memory cards! I used the King James Version for these cards because it’s in the public domain and it’s a classic. The cards can be printed on your home computer (I printed mine on cardstock for durability), and they’re about the size of a 3 x 5 card. They’re great for placing in strategic locations where you’ll see them throughout the day. Stick them on a mirror, tape them up next to your nursing chair, or put one by the kitchen sink. It’s an easy way to be sure you’re meditating on Scripture all day long! 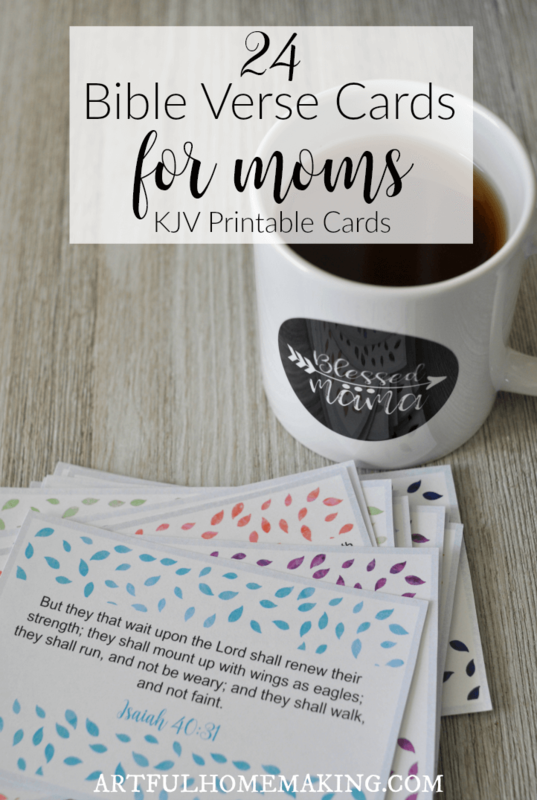 You can find the printable Bible verse cards for moms as an instant download in my free resource library. Simply enter your email in the form below for instant access!